The book "The Art Of Star Trek" by Judith & Garfield Reeves-Stevens is an extraordinary work and my attempt to clarify its deficient areas in the art of hand props is done to help complete their work. I can only hope to achieve its scope and quality in my own efforts. But sadly the book contained numerous errors and mis-attributions of pictures. 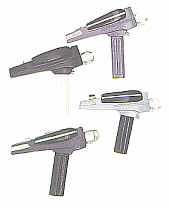 From the classic show, of the four Phasers depicted on page 36, not one is a copy of a "hero" prop. Three of them are background or secondary props, one is a stunt dummy. The shots are taken from the dull side, no Dilithium crystal is visible. The pictures are smaller than most of the other prop shots. The smallness obscures detail, and the main point, I would think, of wanting these in is reference work in the first place. I speculate that pictures were diminished so that this book would not embarrass Playmates toy version and the Franklin Mint pewter reproduction of the Phaser. These companies have obviously been mis-informed about the details. Hero Phasers have only four ribs at the rear, devoid of screws on the left side. There were no gold trim or detailing on any Phaser whatsoever. Both Playmates and Franklin Mint had misshapen Phaser bodies. Comparing these inept reproductions to the real thing could have revealed these changes. Of special disappointment, there are no shots of the Doc McCoy's hypo, medical scanner, field reader or even Mr. Spock's ubiquitous science scanner. From the DS9/Next Generation front, all the shots of the Tricorder faces on pages 120-121 are upside down, every one of them. I believe the paste-up artist doing the layouts here maybe to blame. Upside down faces look so decorative this way, but if you look even closer you will see the covers that open on top are shown on the underside in these pictures. To see what they really look like on screen it is necessary turn the book upside down. Of special interest, the tiny Cardassian contraption on page number 128 is, in reality, one of Greg Jein's remodeled casting off his copy of the "Oscilation Overthruster" from "The Adventures of Buckaroo Banzaii", yes, it is true, Buckaroo's 'the thruster lives on, and in various paint schemes it has been popping up in the Star Trek shows for most of the past eight years. Now we arrive at the most grievous errors. These errors are so bad, so wrong that they are what inspired me to write this article. Many a collector and admirer of the props will be as confused and dismayed as I was that such an authorized work as this would have so many details incorrect. When this book came to the art of the movies, they seemingly lost their way. On the "Motion Picture", there were no pictures or real drawing of actual props used within the film, so they resorted to showing early design drawings. 1) Cdr. Chekov and Cpt. Tirell both had wrist comms. 2) The communicator actually shown is one of the designs made by ILM for the third film "Search for Spock", and this photo is a prototype, not the final filmed prop. 3) The picture on the right side is of that prototype communicator, but the picture on the left is of the prototype of the Phaser one from "Search for Spock". Wrong film, wrong props. Do they think we won't notice these things? 4) There was a box communicator, but it was in silver and black. As before, they had no photographs of the collection or real props from "Wrath of Khan". On "Search for Spock", several pictures on 218 are incorrect. Beginning at upper left and descending, the Klingon communicator is correct as is the Klingon knife. But where in Hades did they get that picture of the Klingon Tricorder? This prop is what a propmaker and collector name a "work in progress." Most of the final detailing is missing. Next at the bottom to the right is a picture of a Starfleet tricorder. Fair enough, it is a Star Trek Tricorder all right. But it is the Tricorder made for Greg Jein for "Star Trek V1- The Undiscovered Country". It was intended to be Doc McCoy's medical Tricorder. Indeed, he beams over with it tucked under his right arm but leaves it on the floor when they lift the Klingon Ambassador to the table. Note: To check this out, beside this picture of the Starfleet Tricorder, there is a still of Merritt Butrick holding the correct Tricorder from this film. Oh yes, one other thing, it is a transparency flip, left is right and right is left. 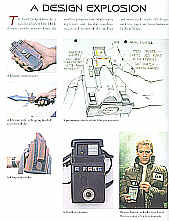 And again, the drawing is of a prototype Klingon tricorder design that was never used within the film. As side note, check out the old classic hypo Doc McCoy uses on the Klingon Ambassador. Was it on purpose that the good Doctor jabs him with the hypo, upside down and with no medicine vial in it? That has got to hurt. On "Star Trek 1V - The Voyage Home", there are no pictures of the real props, as is usual and on page 217 they again mislable a prop. In the center of this page is a Phaser weapon now with leather wrapping around the handle. And they are truthful in claiming it is used in the TV shows and films. In fact, it is on the wall of Cpt. Kirk's weapon display wall in his cabin in "Generations" (page 288). This weapon model began appearing in "Star Trek - The Next Generation" with the episode "The Final Mission" in which Cpt. Picard and Wesley Crusher take a shuttlecraft to help an outpost of miners only to strand themselves on a breathable moon. This model was from the older shuttlecraft's weapon stock. But again, this prop was incorrectly identified as a "Star Trek 1V" prop. It is the Phaser designed by ILM and made for "Star Trek 111- The Search for Spock". It did make a showing in "1V" as guard's weapon, in his holster. On "Star Trek V", there were again no pictures of the props. As a final nitpicking, on page 269, they show the "Undiscovered Country" Phasers. But they were originally made for the last film "The Final Frontier". I bring these errors to people's attention because so many people who are already confused about the fine details will have a tendency to refer to a book such as this as the definitive authority on matters Star Trek. People would assume that the facts in it would be checked and re-checked by Paramount's masters and historians? This was apparently not the case or no one there is such a master or historian. And who am I? Just a propmaker who happened to work on Star Trek(s) 2,4,5,6, who has spent the past twenty years studying and learning everything he can about all props. And cares about keeping the records correct.